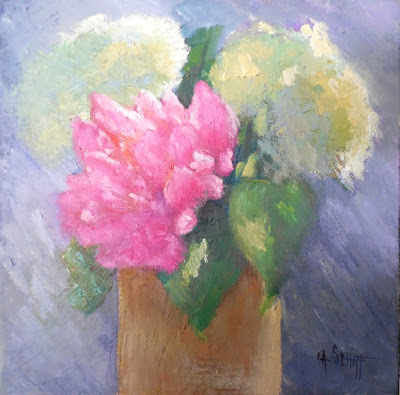 Daily Painters of Florida: Floral Still Life, Daily Painting, Small Oil Painting, Flower Still Life, 12x12x1.5" Oil, "Garden Bounty"
Floral Still Life, Daily Painting, Small Oil Painting, Flower Still Life, 12x12x1.5" Oil, "Garden Bounty"
I picked these flowers (peony and hydrangea) from my garden, and placed them in sunlight. I have to admit, I struggled with this piece. I started with a brush, but after much frustration, I turned to my trusty palette knife. In the end, I am happy with the values, and the glow on the hydrangea on the rigfht. And the colors, love the colors. In fact, the more I look at it....the happier I get! So the moral of this story is, don't give up! Labels: daily art, flower painting, hydrangea painting, oil knife art, peony painting, price - 260.